The capture of your wild horses by permit holders has begun. It is just a matter of time before the freedom and lives of these beautiful horses comes to an end. WHOAS is absolutely opposed to this capture and maintains that despite the ESRD’s arguments, there is no need for this method of alleged population management. One of the biggest detriments to the wild horses is the terminology of calling them “feral”. We feel that it is demeaning to these beautiful creatures and allows for the negative attitudes to persist among those opposed to them. Therefore the mismanagement continues despite many peoples’ efforts to provide current and correct information. There are those who align themselves with the ESRD’s stance listening only to the misinformation leading them to their own biases against the wildies. This fact is very evident in some of the information I have seen recently. WHOAS has always had to come to the defence of your wild horses and continues to do so today. We have always insisted there is a better way and acknowledge that humane and scientifically proven population control methods are necessary to sustain healthy herds and protect the environment. In 2004, at the request of Rangeland Management, WHOAS did prepare a report outlining our suggestions for management. This was totally ignored as have been all our follow-up suggestions throughout the years. Maybe that is why the government was not honest and forthright in advising the people of Alberta of their decision to proceed with the capture season. As stated in previous posts, one of our main recommendations for population control would be the removal of younger horses that could be gentled and adopted out. This would only be necessary if the horses in a certain area were reaching a point where they were causing problems. Along with natural mortality and predators, this would quickly allow for proper control of the populations. We are actively working toward establishing a rescue and research facility that would allow us to implement this plan more effectively than we can right now just using private facilities. The other method of helping to control the wild horse populations is the use of a fertility control drug called PZP. This is an injection that could be administered to wild horse mares by darting them causing no harm. This mare then would not come into cycle for up to two years. 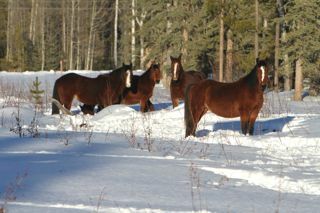 We are actively working with veterinarians to convince the government of Alberta to encourage us to go ahead with this. This drug and method of population control has been used in other locations, including zoos, where it is necessary. It has been proven to be a very effective method. This allows control without physical removal of animals. Don’t you think this is a much favourable method? On population control, a biologist from the U of Alberta, who is aligned with the ESRD and who stated in the Calgary Herald, “Cougars in particular can be very good predators of horses, especially male cougars,” and further, “we had one large male, a 180 lb. male, that in one year killed 17 wild horses, 5 elk, 4 moose, and only 2 deer.” But he still suggests that predators are not enough to control the numbers. Common sense would suggest that this is one cougar in an area that contains a large number of them, so if one takes 17, how many are these other cougars taking? Would you not consider this to be “control?” I, myself, have seen many cougar kills of horses over the years. In a recent previous blog, we put up a letter written in 1983 where the writer who was a wild horse advocate in those days, stated that according to the government’s own numbers there were 2,000 head of free-roaming wild horses. In some of my research just before 1993 when the horse capture regulations were introduced, 1,300 horses were said to be the population. So maybe the horse numbers are just returning to previous values. No matter what the case, it is amazing to hear from individuals from the government that the numbers are “out-of-control”. One would also question that according to them, population growth is 20% a year. Why would they be calling for the cull of 25%? Some research on wild horse growth, under ideal conditions, indicates it is only 10%. WHOAS truly believes that our alternatives could be effective and totally humane if they would just be accepted instead of being ignored. Thanks for the updates. I am so sad that this is happening. Thanks for being a voice for these animals. Just wrote letters to the Premier and Minister. Public polls show a 90% result of people wanting the cull stopped and the animals left alone. Please continue with the media, as this will become world wide. Good news the Wild Rose party is speaking up today. I saw something on facebook today saying “based on the Feral Horse advisory committee some of the captured horses will be tested for EIA. Have you heard anything or anymore about this?